Confession time: I don't own a GPS. Okay I guess technically I do since I have a smart phone with a GPS, but I don't use it. My husband does use the GPS on his phone and occasionally we use that when we are travelling. But for the most part we are operating off of paper maps and directions I printed out from Google Maps. Part of this is because of habit - we started travelling together before GPS's really went mainstream so we like using paper maps. Part of it is because I'm generally really good at navigating (Brandon calls me a human GPS), and part of it is because when we do get lost it's kind of fun to see what we end up finding. Our trip to Balanced Rock was a prime example of how rewarding getting lost can be. We weren't even supposed to be heading toward Balanced Rock. We'd just finished up at Niagara Springs and I was hoping to visit the Ritter Island Unit of Thousand Springs State Park before crossing over the Snake River and visiting Balanced Rock. But we took a wrong turn and ended up on 1700 East which took us over the Snake river and headed south. I considered turning around, but then I looked at the map and realized we could keep going south and head into Buhl. I knew Buhl was on the way to Balanced Rock so I decided we might as well go see Balanced Rock next, and then we could try to catch the Ritter Island Unit later in the day. The trouble was that now we were off of my planned route. The paper directions I'd printed were no longer helpful. Still I figured we it couldn't be that hard to find Balanced Rock. We'd just head southwest after Buhl and we would be bound to see a sign or something pointing us in the right direction. In Buhl we made our second wrong turn of the trip. We were on Clear Lakes Road and we should have made a left onto Burley Ave. That would have taken us on a somewhat direct route to Balanced Rock. Instead we made a sharp left onto Highway 30/ Broadway. That road took us down the Main street area of Buhl - which was very picturesque, but not the direction we needed to go. Highway 30 headed northwest and by the time we got off of Highway 30 I wasn't sure where we were. All I knew was that we needed to head further south and possibly further west. We headed south, but there was no sign of any balanced rocks, or really rocks in general. We were just driving past field after field after field. Everything was flat. I had no idea how there could be any interesting features out here. I kept hoping eventually we'd find a sign that directed us to Balanced Rock, but so far we didn't see anything. My goal was to at least get us onto a road that was listed on my directions. My anxiety was also pretty high. Getting lost usually pays out in the end, but until then I just WORRY. I had the sense that we were still too far east and so as we worked our way south we tried to go west as much as possible. But it seemed every time we turned onto an east/west road it would curve and start heading north/south. 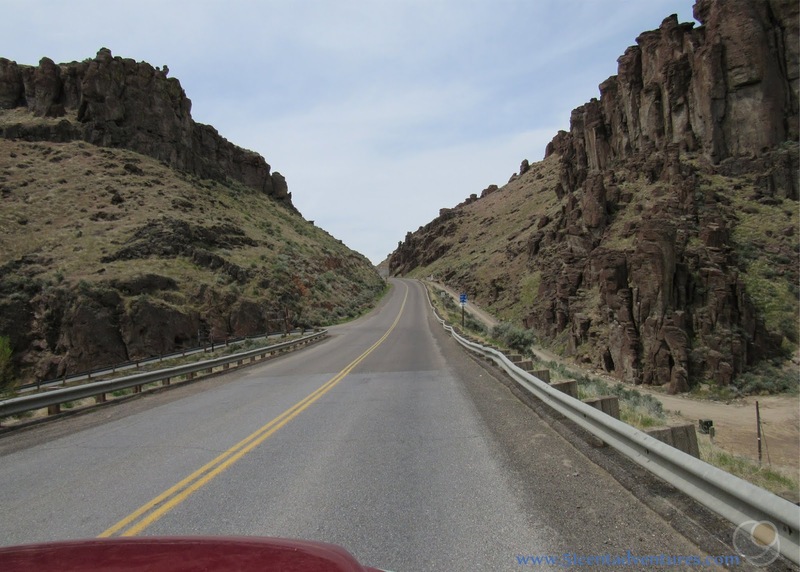 Eventually we made it to 3700 North (what this road was north of was a mystery to me since we were south of Buhl which was the only city of note on my highway map of Idaho.) This road really had some promise. 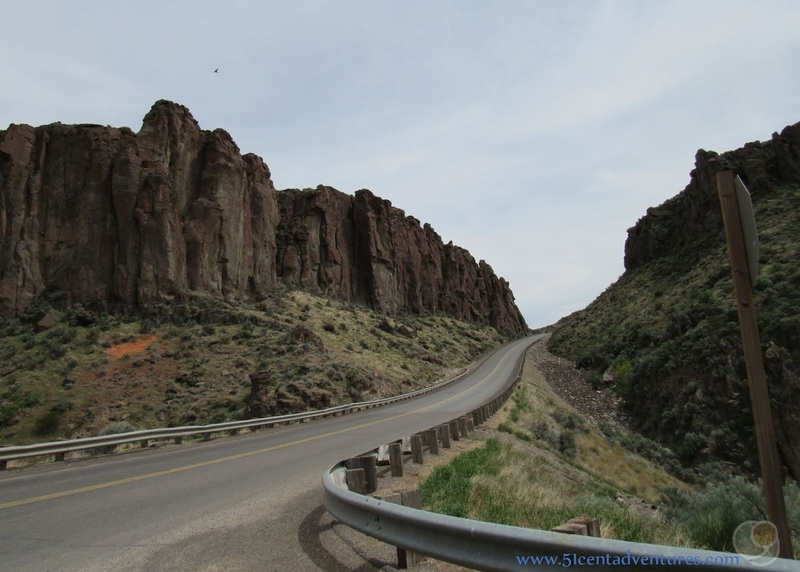 I still didn't see much that looked like a Balanced Rock, but the road was taking us down into a river bottom canyon that seemed to have some cool rock features in it. After all the farm land we'd passed, the canyon was pretty interesting. I learned later that this is the the Salmon Falls Creek Canyon. 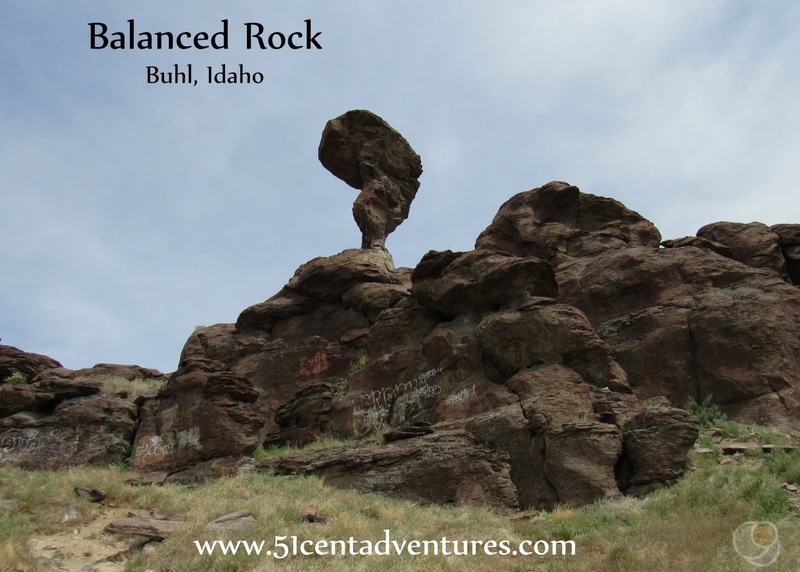 Finally we saw a sign for Balanced Rock. It was only another mile down the road. The sign also said that Balanced Rock Park was to our left. 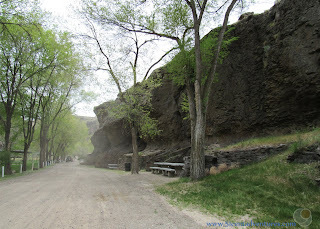 I hadn't read anything about Balanced Rock Park so I was curious to see what it was. 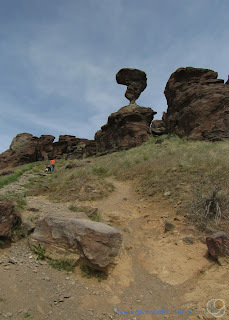 The park was closer than the actual Balanced Rock so we turned left to check it out. 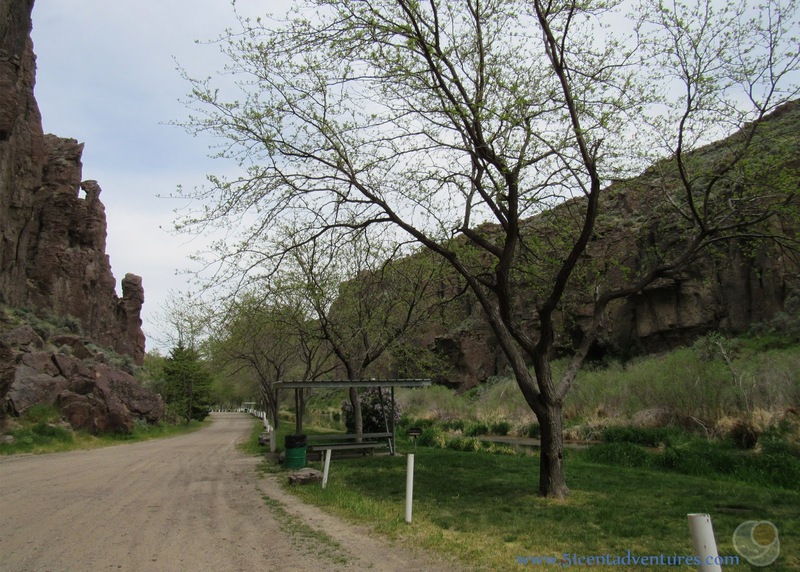 We were amazed to find a beautiful little picnic area tucked between Salmon Falls Creek and cliffs of lava. Balanced Rock Park is owned and maintained by Twin Falls County. There is a large pavilion that you can rent for $50 as well as smaller picnic areas that are free to use. You can even camp at this park. Camping is free because there are no RV hookups or sewer dumps. The campsites are first come first serve so it's best to get there either Thursday night or early Friday morning. The kids wanted to play at the park, but Brandon and I were still very interested in seeing Balanced Rock so we decided to continue on and then come back to the park. We got back onto the road which was not called Balanced Rock Road and drove west. We came out of the canyon and emerged onto a barren landscape. The east side of the canyon had been green agriculture land. This western side was just dry range land. 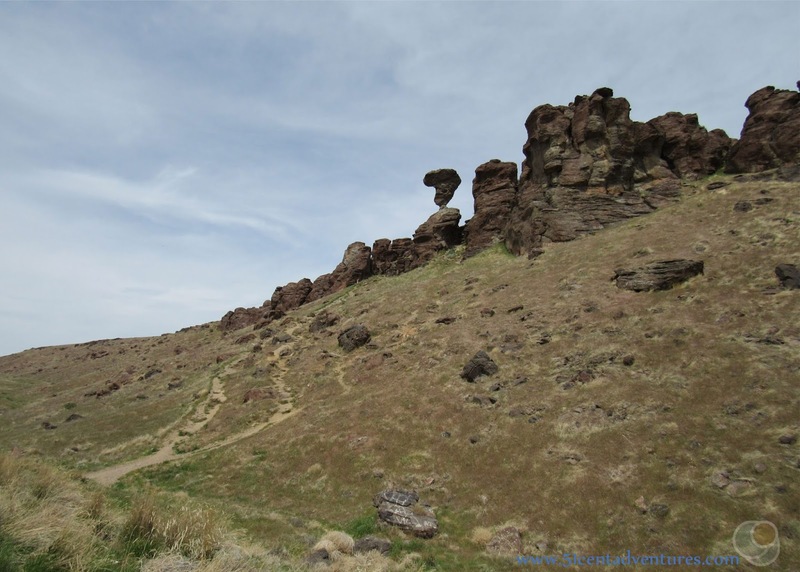 After the lush greenery of Balanced Rock Park, the barren landscape surrounding Balanced Rock was a little jarring. There were tall pinnacles of rock and we started searching for Balanced Rock. Finally it came into view. There was a parking lot at the base of a small hill. 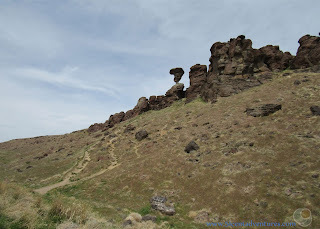 A steep trail led up the hill below Balanced Rock. 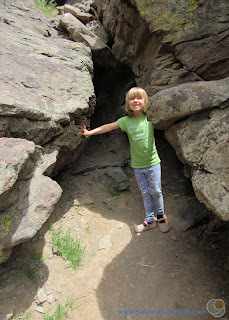 We'd been in the car a long time so we decided to go for a little hike to see the rock feature up close. I don't recommend this trail to everyone. It was very steep, and had lots of loose rocks. But my kids liked it. Especially after driving around in the car for the last half hour. Here's the view from near Balanced Rock. 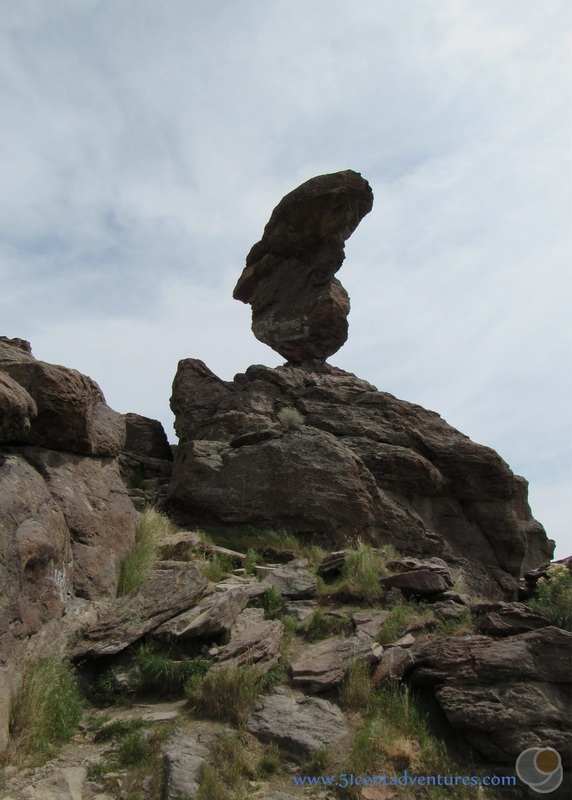 Here's Balanced Rock up close. My kids said it looked like a nose. The trail didn't really lead anywhere in particular. It ended at a small cave of sorts. The BalancedRrock area was hot and dry so we didn't stay long. We wanted to go back to the park. I was looking forward to seeing the trees again. Also, we all needed to use restrooms at the park. We stayed and played at the park for a little while. Honestly we could have stayed much longer, but we had other places to visit. We never would have found this park if we'd traveled on the original route on my directions. My directions would have taken us to Balanced Rock from the western side of the feature. We would have come down Castle Glen Ferry Road/400 East. I imagine we would have admired the rock and then gone back the way we came. 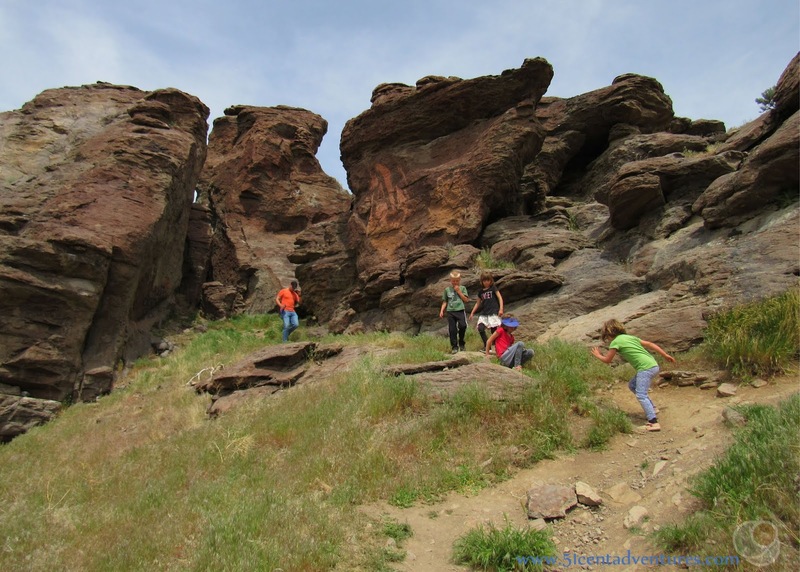 We probably wouldn't have traveled into the canyon and found Balanced Rock Park. And that's why I like travelling without a GPS. I like the little things we find when we wander off our planned route. 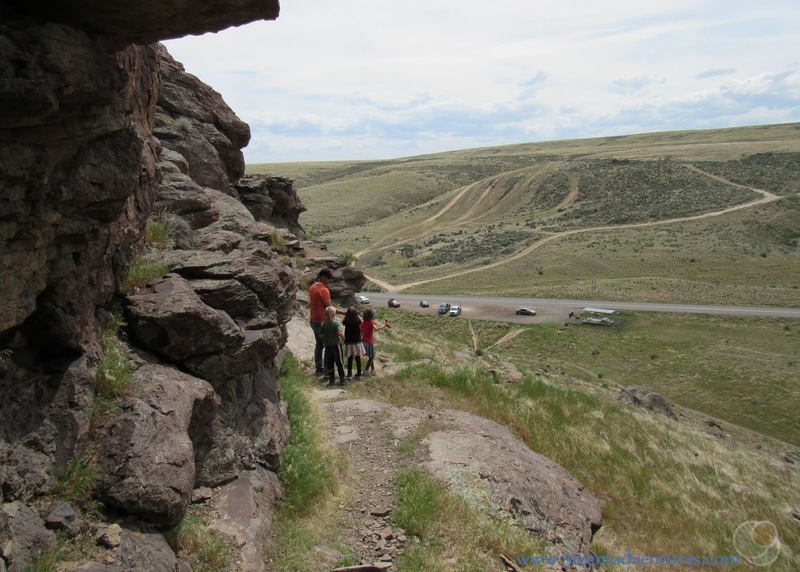 Recommendation: Balanced Rock is a fun little side trip from Twin Falls. 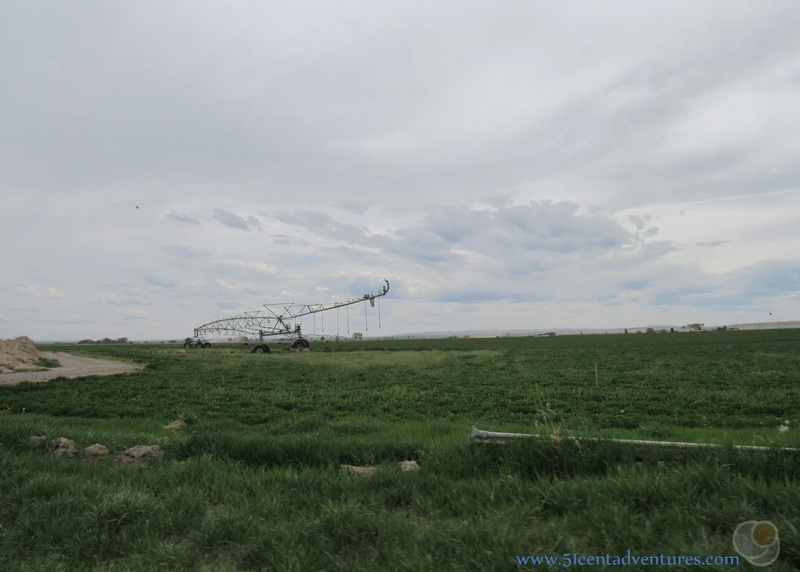 I wouldn't say it is a "must see" feature, but it is a great destination for a little day trip. 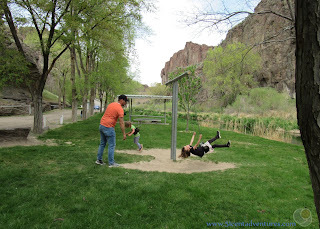 Be sure to spend some time in Balanced Rock Park. That place is a hidden oasis. Directions: Pay attention here so you don't end up lost. If you are in Buhl you'll want to get onto 1400 East and then take that road south until you reach 3700 North. Turn right onto 3700 North and travel west. 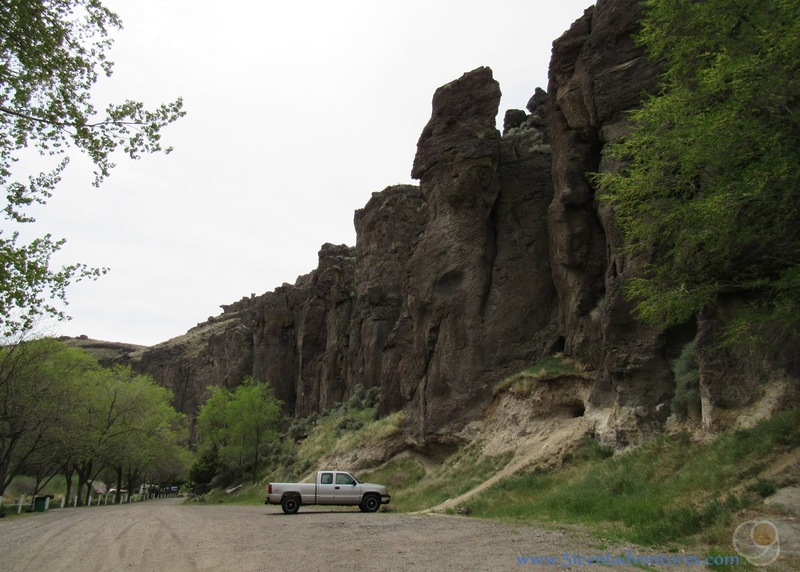 3700 North becomes Balanced Rock Road and will take you down into the Salmon Falls Creek Canyon. Balanced Rock Park is in this canyon. It is a left turn off of Balanced Rock Road. To reach Balanced Rock keep following the road for about another mile. Balanced Rock is on the north side of the road.